"Erica has been a benefit to our training program in several ways over the years. 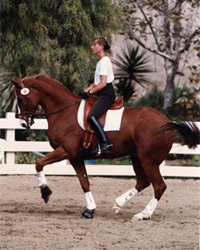 We first got onto the lunging program which was a huge hit for our adult amateur clientele -- very popular in addition to being very helpful to our riders moving up to warmbloods from smaller moving horses. When I was training in Europe, Erica was the perfect stand-in trainer for me: she had a working knowledge of the students and their needs, and delivered correct lessons, keeping everyone progressing rather than treading water while I was away. It was so nice to come home to students who SAT BETTER!! I also appreciate that she can do temp work and I don't worry about what my students are learning while I'm away: she is correct and consistent." "With Erica's help I have been able to achieve a more elegant and effective seat. I really feel she has helped open the door for me to move on with confidence into international competition. Her ability to isolate even the most subtle of issues with the rider's position is truly remarkable. Her ability to convey clearly and concisely how and--most importantly why--to make corrections is unsurpassed in my experience riding with top trainers and coaches all over the country. 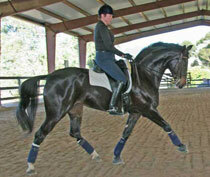 I consider my work with Erica to be absolutely essential to my success as a grand prix dressage rider. I definitely plan to keep her as part of my "team" as I move toward higher and higher goals in the sport."